In December, the Jedi will be under siege in our newest Game Update. But the Jedi aren’t the only ones who should be afraid. Iokath’s Gods have woken up and they are going to be coming after you in some of the hardest encounters that have ever existed in Star Wars™: The Old Republic™. We sat down with Lead Operations Designer Matt Pucevich to talk about what it was like building the Master Mode version of Gods from the Machine Operation. Q: Matt, let’s start with something easy. Can you tell everyone who you are and what your role is on Star Wars: The Old Republic? bits of development, like world and quest scripting. I’ve done some work with a couple of the Imperial story missions on Ossus, for example. 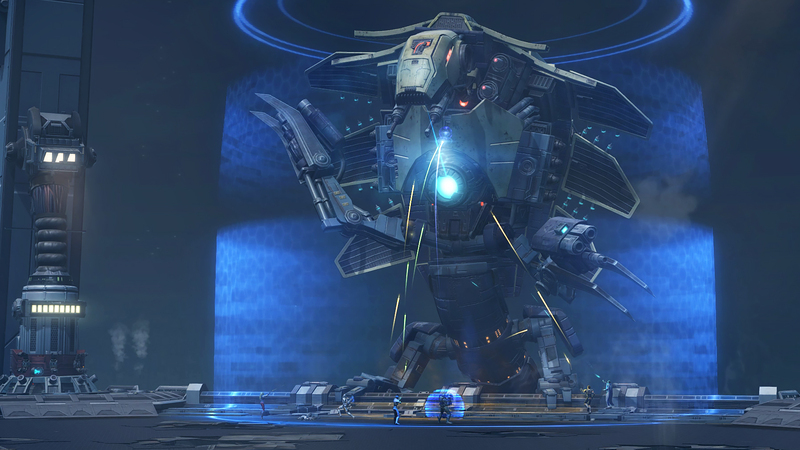 Q: Gods from the Machine is not an entirely new Operation, as it was rolled out one boss at a time over the past year. Can you talk a little bit about the Operation for people who are unfamiliar with it? A: Sure. The Gods from the Machine Operation takes place on Iokath, the incredibly advanced Dyson sphere “planet” originally created by the now extinct Iokathian Creator race. 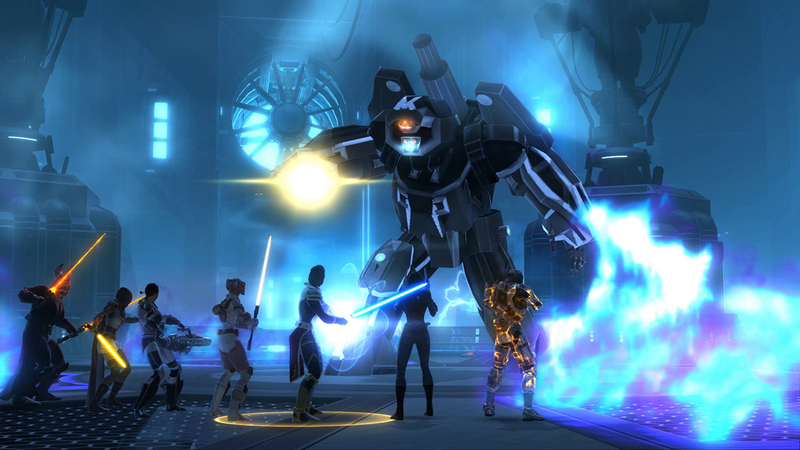 In it, players do battle with the Machine Gods of Iokath. See, centuries ago, the Creators produced a handful of unique machine-beings and then sent them to contact (read: mess with) more primitive cultures for “research” purposes. There wasn’t really any one objective to this effort. Like many of the things the Creators did, this project was a mishmash of multiple objectives: Testing/proofing technologies, synthetic intelligence/personality research, sociocultural manipulation techniques, and so on. Objectives consistent with their culture that valued knowledge and advancement for their own sake, absent (or in their opinion, “transcendent of”) moral boundaries. When these beings were encountered by the ancient, pre-Valkorion Zakuulan culture, the machines were deified. Their appearances, characteristics, and personalities were shaped into mythological beings. These myths evolved over the centuries, leading to the modern-day Zakuulan pantheon: Tyth, god of Rage. Aivela and Esne, twin goddesses of Passion and Envy. Nahut, the Son of Shadow. Scyva, the Mother of Sorrows. Izax, the Destroyer. The Empire and Republic encountered the forgotten gods by happenstance. The factions were each scouring Iokath, racing to outdo the other in securing military technology, and wandered into the Valley of the Machine Gods chasing after a powerful energy signal. This trespass seems to have awakened the Gods and invited their wrath. Q: What is different for you about building Master Mode Gods from the Machine, compared to your prior work on the Operation? A: We’re usually not starting from scratch with Master Modes. Over the course of developing Story and Veteran modes some ideas naturally pop into mind for possible future Master mechanics (or variations to existing mechanics) that can really shake up the way an encounter plays and take it up a notch. 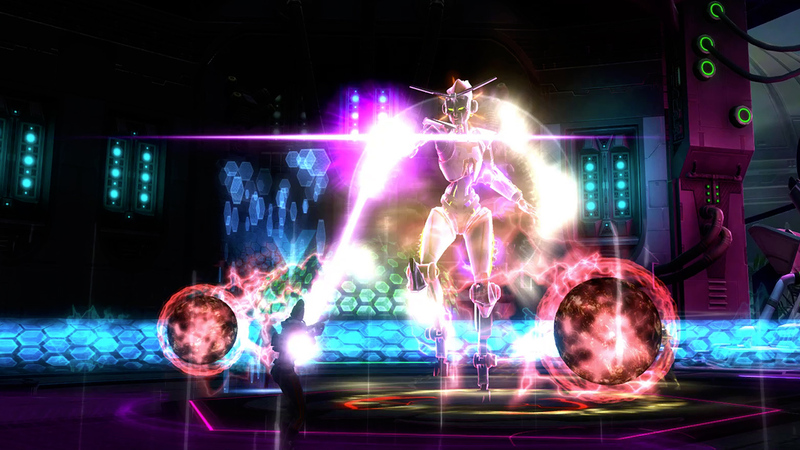 As an example, in Master Mode, Tyth’s Energy Wave attack (his line area of effect attack) has a knockback whose power scales up with his rage. This single addition completely changes the way that players need to approach the encounter, transforming it into an intricate awareness and positioning challenge. Contrasting those ideas against the real-world Veteran play data, we usually have a pretty good idea of where to go. Being able to know and watch how players deal with the Veteran version of an encounter is extremely helpful in grounding assumptions, and culling unknowns. This is the main reason I vastly prefer to design Master Modes after the release of Veteran Mode. Specific to Gods from the Machine, and arguably more importantly, the design of a Master Mode has allowed us to revisit the Veteran Mode and pull its difficulty back to a more Veteran-appropriate place. The PTS testing feedback on that has been encouraging, by the way, so I would encourage you all to check it out if you’ll excuse the shameless plug. Q: For you, what is most exciting about Master Mode Gods from the Machine? What are you looking forward to players seeing? A: There’s an undeniably special sort of fun and excitement that comes from trying to conceive of the “Final Form”, so to speak, of a set of encounters with which players are already familiar. It’s a fascinating sort of design challenge to create something that is just the right distance short of the edge of possibility, such that it can offer a meaningful and challenging puzzle to the most technically proficient players in our universe. Because players are already familiar with the basics of an encounter, you can actually build off of that framework of familiarity. Some things which might be too obtuse to a player with zero encounter familiarity might become feasible for someone who already knows the basic rules. You can both extend existing mechanics to require some additional response or disrupt expectations to force players to reconsider the “known methods” (and sometimes you can sneak in a bit of comedy). The biggest treat as a designer is watching players’ progression through the encounters, from initial confusion and possible frustration, to eventual mastery and satisfaction. There’s a common misconception that encounter designers consider players adversaries and want them to fail, but that’s not remotely true. The goal (at least my goal, for one) is to design something that challenges players to understand and execute, where practice and problem-solving turn initial failure into satisfying success. Q: Last question: any tips for aspiring Operations players as they head into some of the hardest encounters we have ever built? A: I think large group content is really compelling. For me, there’s just something inherently fun about taking on grandiose challenges that require coordinated team play. So, it might sound trite, but I would say first and foremost remember to have fun. Find a group of people you like to play with, and start trying to work down the various operations encounters. Don’t be afraid of making a mistake –everyone’s going to mess up a bunch, it’s part of the natural process of learning encounters like this. With practice, you’ll learn the encounters, the impossible will become possible, and with that comes (at least in my opinion) an immense satisfaction. For everyone else out there… it’s time to get your teams together and get ready to take on Master Mode Gods from the Machine Operation when it launches with Game Update 5.10: Jedi Under Siege this December!